One of the things that often strikes me when reading about medical advances or clinical trials is how variable the reporting of basic and applied research, including animal research, that underpins the clinical research is. In some cases it is discussed in some depth, but far too often it is either skimmed over or not mentioned at all. This is a shame since it makes it more difficult for readers to make the connection between what is happening in the clinic and animal research that may have begun years earlier. A few stories in the news this week illustrate this variability very nicely. I’ll start with an excellent report by Miriam Falco on CNN entitled “Stem cell treatment goes from lab to operating room” which describes a clinical trial of fetal stem cells in the treatment of Amylotrophic Lateral Sclerosis (Lou Gehrig’s disease), a progressive neurodegenerative disease affecting the motor neurons that leads to severe muscle weakness and eventually death as the muscles that control breathing fail. As the CNN report points out research on rats was vital to the identification of the correct type of cells for this transplant, and Dr. Eva Feldman demonstrated that injecting fetal stem cells into rats with ALS preserved the large motor neurons and muscle strength. Lead researcher Dr. Eva Feldman, a neurologist at the University of Michigan, designed the trial just four years ago. After a lot of animal testing, her team determined that using fetal nerve stems rather than human embryonic or adult stem cells (such as bone marrow stem cells) was most effective, she says. Stem cells have the ability to turn into different cells in the body. However, human embryonic stem cells, which come from 4- or 5-day-old embryos, also been found to sometimes turn into cancer cells. Fetal stem cells, such as those used in this trial, are a few weeks older and have already taken on a specific identity — in this case nerve cells. Feldman says the fetal stem cells used in this trial did not become any of the unwanted cell types. “That’s very, very important,” she says. Basic animal research showed the potential of this therapy, but applied research also played an important part in making this clinical trial possible. Through studies on pigs Dr. Nicholas Boulis developed an apparatus that allows the stem cells to be injected at precise locations in the spine, and then practice the technique before attempting to use it on a human patient. Animal testing also proved very useful when it came to figuring out how to actually inject the stem cells. Emory University’s neurosurgeon Dr. Nicholas Boulis invented the device that holds the needle that injects the stem cells. The goal is to inject the cells without injuring the spine and causing even more paralysis. He practiced on 100 pigs before attempting the procedure on a human. Our second report is from the LA Times, and in an article entitled “A personal fight against a lethal childhood illness” reports on the work being done at the Centre for Duchenne Muscular Dystrophy at UCLA. It’s a nice report which shows how passionate scientists like Stan Nelson and Carrie Miceli are about finding effective treatments and cures for serious diseases. While the report does refer to experimental therapies such as exon-skipping and gene therapy it unfortunately does not discuss them or the research that led to their development in any depth. Exon skipping is a particularly innovative approach to treating some cases of Duchenne Muscular Dystrophy (DMD) where the disease is due to a mutation in the dystrophin gene that stops translation from messenger RNA prematurely and prevents the production of the protein dystrophin. In exon-skippping a molecule known as an antisense oligonucleotide or morpholino acts to remove the portion of mRNA that contains the mutation and allows the translational machinery of the cell to read through and produce a working dystrophin protein. As I discussed in an article last year research in mice and dogs has been crucial to the development and refinement of exon-skipping and early versions of this therapy have already had promising results in clinical trials undertaken at Great Ormond Street Hospital in London and Royal Victoria Infirmary in Newcastle. Gene therapy, where the faulty dystrophin gene is replaced by a working version, is also being developed, though it has not yet entered human clinical trials. A recent review (1) available to read for free at PubMed Central discusses the progress that has been made in recent years, the challenges that remain before DMD can be cured, and the vital role played by animal models in overcoming these challenges. The review also covers stem cell therapy for DMD, another exciting approach to treating the disease that we have discussed previously. The final news item is a BBC report on a successful clinical trial of stem cells to treat Multiple Sclerosis, this time using stem cells isolated from a patient’s own bone marrow. 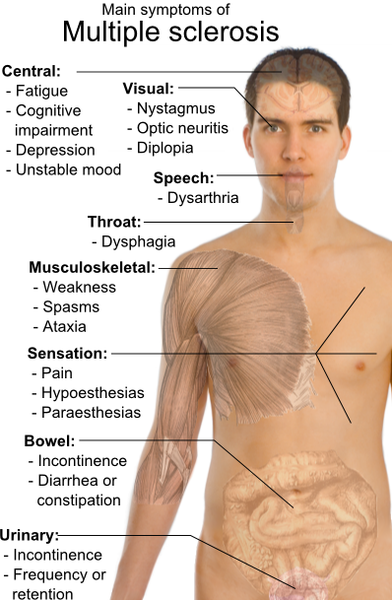 Multiple Sclerosis (MS) is an autoimmune disorder where the patient’s immune system turns on the myelin sheath that insulates the axons of nerve cells, leading to a range of often serious neurological problems. At present few effective treatments have been approved for MS, and several are currently being evaluated in clinical trials. While the improvements seen in the clinical trial were modest they do hold promise for longer and lager trials that are now being planned, and I suspect that as with other therapies the key might be to start treatment early to prevent damage as well as allowing damage to be repaired. The trial at Frenchay Hospital in Bristol built on years of careful animal research, including research conducted by Professor Neil Scolding who lead this clinical trial. Interestingly the research, conducted in mice with experimental allergic encephalomyelitis that reproduces many of the features seen in autoimmune diseases that attack the myelin sheath, showed that rather than replacing the damaged cells that produce the myelin sheath or nerve cells the injected stem cells protected the myelin sheath and nerve cells by turning down the pathogenic immune response responsible for damaging the myelin sheath (2,3). This was important since it meant that it was not necessary to inject the stem cells directly into the site of the MS lesion, rather the cells could be as (if not more) effective if injected into the bloodstream so that migrate to tissues such as the lymph nodes where they can interact with cells of the immune system. This discovery paved the way for the clinical trial reported by the BBC. There’s a lot of stories in the news that are relevant to animal research, the trouble is that it’s not always easy to see the connection. At Speaking of Research we believe that the onus is on scientists to make sure that when they talk to reporters they give the full picture of what their research involves, and what earlier studies it depended on. Only then can the public really begin to appreciate just how important animal research is to continued medical progress. Posted on May 7, 2010 May 21, 2010 by EditorPosted in Science NewsTagged Amylotrophic Lateral Sclerosis, antisense oligonucleotide, autoimmune disease, axon, BBC, bone marrow, bone marrow stem cell, Bristol, Carrie Miceli, CNN, cystic fibrosis, dog, Dr. Eva Feldman, Dr. Nicholas Boulis, duchenne muscular dystrophy, dystrophin, experimental allergic encephalomyelitis, Fetal stem cell, gene, LA Times, Lou Gehrig's Disease, messenger RNA, Miriam Falco, morpholino, mouse, Myelin sheath, Neil Scolding, nerve cell, pig, rat, Stan Nelson, stem cell, ucla.